The Bad River Ranch is a 141,000-acre property located in the mixed grass prairies of central South Dakota. 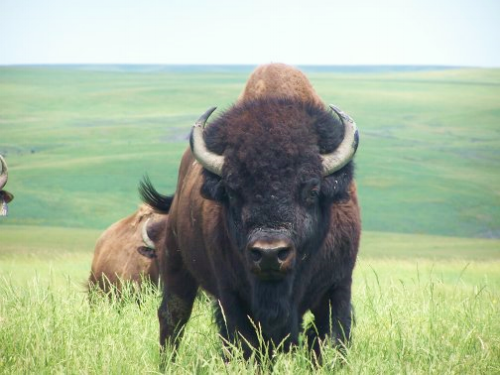 Mixed grass prairies served as important ecosystems historically for bison as well as many species of wildlife. This ranch was acquired recognizing its value for bison production and conservation with objectives to restore range conditions and conserve other native species alongside bison production. Bad River Ranch maintains one of the largest bison herds in South Dakota and has been ecologically and economically sustainable. Due to size, our maternal bison herd is divided and runs in two groups. Both herds are managed for production and rotationally grazed through 34 pastures year-round with minimal supplementation. During bison works in the late fall, our cows are pregnancy checked, vaccinated for Mycoplasma and dewormed. Open cows are normally culled from the herd in normal growing conditions. Our calves are weaned in the late fall or early winter. All heifers are vaccinated with RB51 for Brucellosis. At weaning the calves are held in large groups and fed hay and cake until the spring green up after which they receive only minimal supplementation. During this time, they are introduced to partial electric fencing to create an early awareness to respect and avoid fence lines. They are then grazed in large yearling herds for the summer and fall until going into the breeding herd as replacements or into the on ranch feeding facilities. Many of the cross fences on Bad River Ranch are only two wire electric fences which successfully contain the herds due to the early exposure. Extensive use of the cake truck also teaches them to respond to its presence and use. Whenever they are handled and herded on foot or ATVs they are taught to receive and give to pressure. This “training” that starts at weaning helps them to successfully graze the ranch as yearlings with respect for both humans and fences. All ranch hands are trained in low stress livestock handling techniques which are utilized each time animals are moved or handled. The Bad River Ranch bison herd is naïve to Mycoplasma. The herd is annually vaccinated and has never experienced an outbreak of the disease.